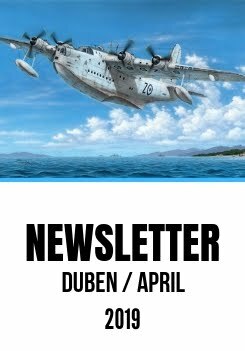 Now as we write the introduction for the March instalment of our regular Newsletter, we have just finished hustle and bustle of negotiations with our partners during the 2017 Nuremberg Toy Fair in Germany. This almost a week-lasting process of meeting with the partners and customers has been extremely exhausting, but on the other hand it has brought to us also inspiration for our future work. We do believe that all our 2017 news announcements (see list attached) will be inspirational for our customers too because almost all of the visitors at our fair stand acknowledged positively the ever-increasing quality of our products. And We are also happy to say that our products' quality has won us two awards at the fair. The centerpiece of our stand was the 1/32 scale Tempest Mk.VI kit which is scheduled for early summer release. Also our 1/48 Junkers Ju 88C-4 and Ju 88D-2/4 kits aroused interest amongst the visitors. Here I have to mention that the C-4 version kit has already been made available on the market. Perhaps the biggest surprise of our newly announced projects was the reveal of the 1/72 Curtiss P-40 family of kits. Our team have prepared the Allison-powered versions, starting with the P-40E, through short and long K-1, K-10 and M subversions and ending with the final production version of the P-40N. But the way to these models will be much longer than to our March releases which we would like to introduce to you right now. In the late 1930s, the Polish PZL P.11 and P.24 all-metal, high wing fighter planes were produced under licence by IAR, Industria Aeronautica Romana. Using the P.24´s fuselage structure, a new fighter plane was created by a design team led by Ion Grosu and the plane was named the IAR -80. The new fighter had performance approaching that of contemporary foreign designs like the Hurricane, P-36, MS 406 and Bf 109D. Various changes to weapons led to the IAR-80A, B and C sub-versions, and also the IAR-81C which was designed for fighter-bomber role during spring of 1941, although it served in both air interceptor and ground attack roles. The IAR-81C was the most numerous sub-version to be produced (from no 300 to 450), deliveries starting early in 1943.Total production for IAR-80/81 series totalled around 450 units, but ceased (as well as the production of the Bf 109 type that only had just begun) after the American bombing of Brasov factory, on April 16th, 1944. The Romania Air Force´s fighter and ground attack units were equipped with the IAR80/81 type right from the beginning of the country´s involvement in the Second World War and until the end of hostilities. The first fifty IAR-80 airframes were in service during the attack against the Soviet Union on June 22nd, 1941. The IARs of the 6th Group (61st and 62nd squadrons) and the 8th Group (41st and 60th Squadrons) were engaged Stalingrad front during the autumn of 1942. August 1st, 1943 saw IAR-80 & 81s defending the Ploiesti oil plants from attack by USAAF B-24 Liberators, during “Operation Tidal Wave”, when the Rumanian fighters downed some of the heavy bombers. On June 1Oth, 1944, IAR-81Cs from 6th Fighter Group confronted P-38 Lightnings belonging to the USAAF 82nd and 1st FG (American pilots mistakenly reported having fought Fw 190s). Romania joined the Allied powers in August 1944, and changed back the national insignia worn by its aircraft from crosses to traditional blue, yellow and red roundels. Being under Soviet command, the IAR-80/81 units saw combat over Hungary and later also during the liberation of Czechoslovakia over the areas of Moravia and Slovakia, where they enjoyed and suffered their final victories and losses. Remaining airframes of the 80/81 type kept on serving in Romania until the 1950s, some of them also being rebuilt in 1950 to advanced trainer version known as the IAR-81DC. Beneath the kit box lid with eye-catching action picture a combat-engaged IAR aircraft, the modeller will find five sprues with inject-moulded styrene parts, some of them made using metal tooling moulds, a clear cockpit canopy and several other clear parts, nicely detailed resin parts and a set of PE parts. The decal sheet printed by Italian Cartograf in superb quality caters for four Romanian machines, three of them bearing war-time crosses and the last one in post-war scheme with Romanian roundels. The Bücker Bü 181 was of similar design and construction to its predecessors, the famous and successful German sporting and training aircraft the Bucker Bu 131 and 133 but the new type was a monoplane with an enclosed cockpit canopy protecting the crew of two who sat side by side. The low mounted wing was of wooden construction with plywood and fabric skinning while the fuselage mid section consisted of tubular steel framework covered with fabric and the rear fuselage was a wooden shell. The flying qualities of the new machine were found to be excellent and, following thorough flight testing by the German Ministry of Aviation it was introduced into service with the Luftwaffe as their standard training aircraft with official name `Bestmann'. Production commenced in 1940 and there were two main versions, the B and C which differed due to their powerplant being either a Hirth HM 500 A or B. The need for training aircraft grew as the war progressed so the type was not only produced by the parent Bücker company in Rangsdorf, but Fokker in the Netherlands and Zlin in the then Protectorate of Bohemia and Moravia also set up production lines too. After the end of the war, the Bucker Bestmann continued to be produced in liberated Czechoslovakia for the military and also civil aviation markets, with several different powerplants installed. During the war, licence production of the Bestmann was also carried out in Sweden as the Sk 25 and in 1950 Egypt`s Heliopolis Aircraft Works obtained licence rights for Czechoslovak the Z-381 to produce its own version known as Gomhouria (or "Republic") powered by a Walter Minor 4-III engine. Although it was primarily a trainer the Bü 181 Bestmann was also used for light liaison duties but towards the end of the war as things proved more desperate for the Germans it was even pressed into action as a ground attack aircraft armed with either four anti-tank grenade launchers or Panzerfausts, with two mounted on each wing, or even three 50kg bombs carried in a special rack. A large number of Bestmanns were pressed into service with the British Air Forces of Occupation (BAFO) immediately after the war as light liaison aircraft and were later passed on to the French. Those machines of Swedish, Czechoslovak and Egyptian origin flew until the 1960s and some of them can be seen in the sky even today. This reissue of our 2016 kit brings three airframes operated by the Panzerjagdstaffel unit, all of them in a standard Luftwaffe colour scheme. One of the machines has an interesting fate as it was used by a crew defecting to Switzerland at the end of the war. Three sprues of plastic parts accompany a set of resin and PE parts. In 1954, Czechoslovak gliding enthusiast together with VZLU's (Research Aviation Institute) chief designer Ing. Karel Dlouhy begun the development of a two-seater glider for advanced training. The first of two prototypes was test flown in March 1956. The production of the modified glider started in 1957 in Let Kunovice aviation factory. This company had produced these all metal high-wing gliders, designated the L-13 Blanik, until 1978 with total of 2616 gliders produced. The modernized L-13A version was produced during 1981-82 period in small batch using strengthened wing taken from engine powered Vivat gliders. The Blanik, thanks to its flying characteristics and durable all-metal structure, was popular and widely exported to all continents except Antarctic. It was flown or still flies in forty countries of the World. Please note, that we still have a discount on our CMK sets. Check them out on our e-shop - just click on the link below. The set offers all-new and superbly-detailed camera equipment for a widely used recce version of the F-84F Thunderflash jet aircraft. Not only are the cameras much more detailed, they also come as one-piece parts. The maintenance panels of the recce camera compartment bring higher levels of detail and come with padded sidewalls missing from the original kit parts. This set offers three standing figures of WW2 FAA airmen. Intended to accompany Special Hobby Fairey Barracuda model, but suitable also to be used with another FAA aircraft models as for example the Swordfish, Albacore or the Avenger (Tarpon). One of the F-84F Thunderstreak/RF-84F Thunderflash jet aircraft users was also the German Bundesluftwaffe that fitted its machines with new MB GY5/GT5 ejection seats. In the Tanmodel kit, unfortunately, this type of the hot seat was left out which gives us the opportunity to bring you the correct type now. It is not necessary to adapt the kit for the use of our seat. This set brings the modeller new landing gear wheels with nicely detailed tread as used on post war Tempest fighter aircraft.